This is Bruin at 4 months. Robert, Thank you so much for sharing your great little story all about your new German Shepherd puppy Bruin. There’s nothing like a new German Shepherd puppy to help you pick up your spirits. And I'll tell you right now that I love the picture you have sent in of Bruin and I also just enjoy the name Bruin too - not one of those you hear every day. 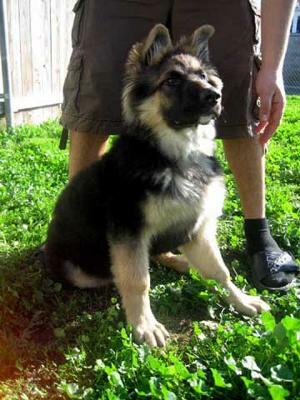 He is an absolutely gorgeous coated German Shepherd puppy. Good luck with him. I can't believe the likeness between Bruin and my new puppy Molly!!!! They are almost identical!